Mark, unfazed that a gap in the Standing Orders had stopped past efforts to eject defecting MPs, said these House rules elsewhere let him deem Kamla Persad- Bissessar as the UNC leader in the House who is the apt person to trigger the process of Volney’s removal. Hardly had Mark finished his ruling when Volney rose from his place, shook hands with Chaguanas West MP and ILP leader, Jack Warner, and quietly left the chamber, pursued by reporters. Mark said on September 3, he got Persad-Bissessar’s letter dated August 26, which said Volney, elected under the UNC, had told her by letter he had resigned the party with immediate effect. Mark said section 49A(1) said that in such circumstances the party leader in the House must write to inform the Speaker, who shall at the next sitting declare the MP to have resigned or been expelled from the party. The MP has 14 days to mount a legal challenge to such ruling (49A(2) and 49A(3)), or if not he must vacate his seat after that period, and cease to perform his functions as a member of the House of Representatives, only to resume if he wins his legal proceedings (49A(4)). The Constitution (49A(5)) says the Standing Orders must make provision for the identification and recognition of each party’s leader in the House. Mark said the question is whether the lack of a specific Standing Order identifying each party leader under 49A(5) would frustrate the crossing of the floor debarment of an MP under.49(2)(e). intention that the making of Standing Orders should be a prerequisite for the Speaker to invoke49A; and whether any procedural gap exists due to the lack of such Standing Orders and could such gap be filled in some other legitimate way? He opined that section 49A in itself is “an almost complete procedural code” and that any gap in the Standing Orders does not bar his exercise of powers or jurisdiction over Section 49A of the Constitution. Mark then quoted two rules that give the Speaker a certain discretion to rule, and that suggest the Prime Minister is her party’s leader in the House. Firstly he quoted Standing Order 92, on “General Authority of the Speaker”, saying, “The Speaker shall have power to regulate the conduct of business in all matters not provided for in these Standing Orders” and “the decision in all cases for which these Standing Orders do not provide, shall lie within the discretion of the Speaker, and shall not be open to challenge”. Secondly, he cited section 76(1) of the Constitution which says the Prime Minister is the MP who “commands the support of the majority of Members” (or in a minority government) is the MP “most likely to command” such support. Mark said since Persad-Bissessar was identified as UNC leader to become Prime Minister under 76(1), she should now also be recognised as UNC leader under the “Crossing of the floor” provisions under 49A of the Constitution. Mark gave a five-point ruling. Firstly, Section 49(2)(e) of the Constitution says an MP who resigns his party must vacate his seat. Secondly, Volney had notified him of his resignation from the UNC. Thirdly, the failure to make Standing Orders mentioned 49A(5) does not invalidate 49(2)(e) of the Constitution. Fourthly, despite the lack of Standing Orders, the Speaker is empowered to ascertain the leader of any political party in the House. Fifthly, Persad-Bissessar is unquestionably the UNC leader in the House, and it was appropriate for her to notify him of Volney’s resignation. Volney, talking to reporters later, accused Mark of violating his constitutional rights, promised a legal challenge and vowed to continue to serve his constituents on the ground while Warner handles St Joseph constituency affairs inside the House. 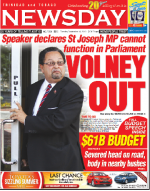 “I think that I will leave it to my attorneys to take the necessary legal action to show that the Speaker has violated the Constitution and has deprived me of the protection of the law,” said Volney. Volney said that while he had expected the ruling last Friday from Deputy Speaker Nela Khan in the chair, when that had not occurred he was not surprised when it happened yesterday. Would he resign and run in a bye-election? He declined to spell out the details of his upcoming legal challenges to the Speaker’s ruling, but would let his lawyers do their work. Mulling a legal challenge by Volney, or a bye-election in St Joseph, Persad- Bissessar said, “We will be prepared for any eventuality, whether it be with respect to the legal action or with respect to a bye-election.” On whether the House Standing Orders should have been amended to recognise her as the leader of the party in the House from which Volney resigned, Persad-Bissessar said, “Given the Standing Orders were not there, my legal advice and my own advice to myself in this regard was that the Standing Orders would not preclude the action, the declaration being made.” Opposition Leader, Dr Keith Rowley, later told reporters, that Volney has gotten his “comeuppance,” and he hoped Volney would now tell what happened with Section 34. “This development has no precedent in our Parliament and therefore I am absolutely certain there will be to-ing and fro-ing in the courthouse on this matter,” he said. It’s time St Joseph MP Herbert Volney sees his friends for what they are. This was the advice given by Opposition Leader Dr Keith Rowley after Speaker Wade Mark declared at the end of yesterday’s budget presentation that the St Joseph seat was now vacant. Speaking at a news conference held after the budget presentation, Rowley said he was not surprised by Mark’s announcement. “This government has brought to the country nothing but bacchanal and confusion in public administration. “And any government whose prime minister could pick the day of the budget, and also pick, on that day, to solve its political problems by this development, which has absolutely no benefit…the only people who would benefit from this development are lawyers chosen by the Attorney General, and nobody else,” Rowley added. Jack Warner deems it spiteful and vindictive of the Speaker to declare St Joseph MP Herbert Volney’s seat vacant yesterday. Under Section 49 A of the Constitution, Speaker Wade Mark called on Volney to cease performing his duties as MP. Volney shook hands with Warner after hearing the news and waved his hand backward at the chamber while walking out. Warner, the ILP leader and MP for Chaguanas West, called on Volney to resign and have the government tried in the court of public opinion. “I think it is vindictive. I think it is provocative. It is an attempt to frustrate any of those members on the other side who were even having thoughts about joining the ILP. I don’t think what was done today was constitutionally right. I believe Mr Volney has a case and will win in any court. I hope he runs again on the ILP ticket. I am sure Jack can swing things in his favor.